Background: Veal is a rich nutrient medium that provides a suitable environment for proliferation of veal spoiling microorganisms and common food-borne pathogens. In this study, the effects of irradiation on the veal microbiological quality and half life of minced beef during chilled storage was investigated. Materials and Methods: Twenty samples of minced veal were irradiated with doses of 2, 5, 7, and 10 kGy (Cobalt-60, gamma cell 220) and evaluated for their microbiological quality up to 10 days. Results: The results showed that gamma irradiation reduced the number of microorganisms in all the irradiated minced veal samples, with 2, 5, 7, and 10 kGy (P < 0.01). Moreover, the half life of the samples were increased considerably (P < 0.01). In addition, the results indicated that there was a significant difference in the number of coliformes between untreated and irradiated samples (P < 0.05). While, Staphylococcus aureus could not be detected in the irradiated samples with doses of 7 and 10 kGy. Conclusion: These results indicated that irradiation could be employed as an effective mean to inactivate common food-borne pathogens namely S. aureus and increases the half life of veal. The purpose of food preservation is to prevent spoilage caused by the external and internal agents and/or to delay it. As a result, food items will remain consumable for a certain period of time. The spoiling microbial flora and existing enzymes in food causes a negative impact on expiry date of food items. Veal, as one of the highly valuable protein resources, full of necessary amino acids, mineral, various vitamins and enough energy, is classified as the best and most complete food. Veal is contaminated with different types of microorganisms during various phases of slaughter, transportation, storage and processing. The resistance of the microorganisms against irradiation depends on different parameters such as type of food substance, the presence of oxygen and temperature. , Generally, by increasing the radiation dose, more microorganisms will be killed. However, based on FAO/WHO/LAEA specialists committees, irradiation of food item with maximum dose of 10 kGray is allowed, without having any toxicological hazards for the consumer. Today's, applying irradiation for preserving food substances has become prevalent in many countries and various studies have been conducted in this regard. , Although national standards of different countries are dissimilar to some extent, using irradiation with certain doses is permitted only for certain products. According to the best of our knowledge, in Iran there is no study has been managed in this regard and no certain standard exists for irradiation of veal and its products. Minced veal is a suitable environment for growth and proliferation of spoiling microorganisms and food-borne pathogens, and also is considered as one of the fastest damageable substances. The aim of this study was to evaluate the effects of gamma irradiation on microbial quality of the minced Iranian veal. Five kilograms of minced veal in 4°C temperature, containing 15% fat, was gathered from one of the meat centers and transferred to a lab under sterile conditions. They were divided into twenty 200-gram pieces, including one control group and four case groups. The groups were packed in polyethylene packages under hygienic conditions, using the laboratory sterile instruments. Then, the case group samples were irradiated with 2, 5, 7 and 10 kGy dose of gamma at 4°C. The irradiation time was determined by a standard calibrated dosimeter based on dose of cobalt-60 of gamma cell 220. The accuracy of the radiation dose was estimated as ± 2% in accordance with IDAS laboratory (International Atomic Energy Agency). The duration of irradiation for 2, 5, 7 and 10 kGy doses were 96, 240, 335 and 480 minutes, respectively. After irradiation, the samples were conveyed to the quality control laboratory at the earliest possible time and were studied with respect to microbiological quality, on the basis of Iranian National Standard no.5272. Complementary tests were done to isolate and numerate coliforms, according to Iranian National Standard no. 437, and to isolate and numerate Staphylococcus aureus, according to Iranian National Standard no. 1194. , In addition, the colony count of aerobic microorganisms was made during 12, 24, 48, 72, 96, 120, 144, 168 and 192 hours, after irradiating. In order to calculate the amount of absorbed dose, firstly, the radiation doses were estimated by considering the source dose rate and total time of each irradiation. The systematic error in radiation dose was calculated by considering the location of the packages in the irradiation chamber and the distribution of absorbed dose. It should be noted that the calculated time for the amount of absorbed dose was applied to those samples placed in the center of Gamma cell. However, if the sample was placed in another position (rather than the center) in the irradiation chamber, it was received ± %15 of the total dose due to lack of uniformity of dose distribution. Such variations were considered in the calculations of dose received by each package [Table 1]. The most affecting factor, regarding lack of uniformity of dose distribution, was the radiation scattering from the samples in the irradiation chamber. The density of ice pack was considered 1 g/cm 3 . This density is approximately equal to that of minced veal, so the effects of ice pack on the radiation scattering and the absorbed dose was not considered in the calculations. The reason for using ice packs in the irradiation chamber was to keep the veal temperature at 4°C during the irradiation period. The absorbed dose was calculated at three points of each veal package [Table 1]. These parts were selected according to the laboratory conditions. 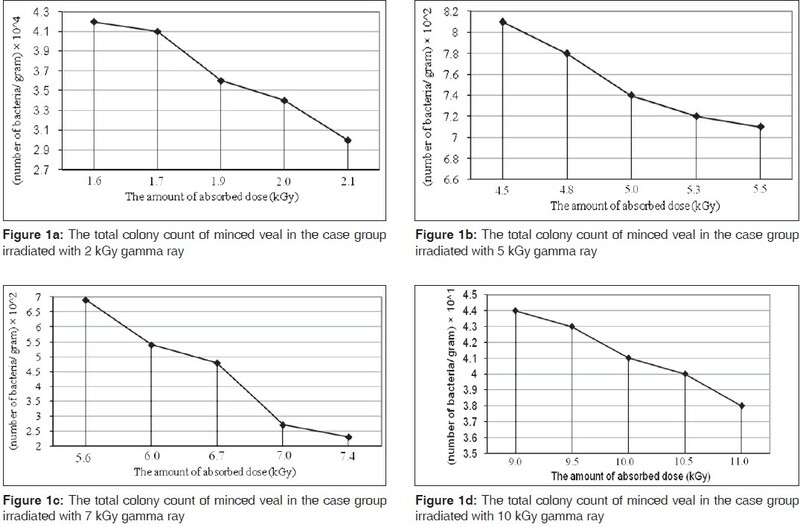 Results of the present study has shown that irradiation at all doses has reduced the microbial load of the studied veal [Figure 1]a-d. By increasing the radiation dose from 2 kGy to 10 kGy, the amount of microorganisms were potentially decreased, so that the mean microbial load of the minced veal samples reduced from 1.8 × 10 6 CFU/g to 4.1 × 10 1 CFU/g [Figure 1]a-d. While, total colony count of aerobic microbes in minced veal was estimated 1.8 × 10 6 CFU/g in the control group.Furthermore, the microbiological quality of the studied samples during 12, 24, 48, 72, 96, 120, 144 and 168 and 192 hours after irradiation increased with preservation time. The preservation period of the minced veal increased from 36 hours to 3, 5, 6 and 8 days, for the groups irradiated with 2, 5, 7 and 10 kGy gamma rays, respectively. The total colony count of coliforms decreased from 4.3 × 10 4 CFU/g to 2.1 × 10 CFU/g in the irradiated samples. Irradiating with high doses (more than 7 kGy) has a negative influence on some organoleptic features and meat quality, including color, flavor and fat oxidation rate. However, considering the significant preliminary reduction of the microbial load of the samples after the first irradiation, the preservation period of the minced veal increased by up to eight days, for the group irradiated with 10 kGy gamma rays. Similarly, the results of studies conducted by Kiss et al. (1990)  indicated that the expiry time for meat which was minced, packed and preserved under refrigerator conditions, increased to about 3 times after irradiation with more than 2 kGy gamma rays. Based on the results of the present study, the total colony count of coliforms decreased significantly in the irradiated samples (2.1 × 10 CFU/g). This finding is in agreement with AL-Bachir et al. (2009) study. Al-Bachir et al. showed that the total coliform colony count in camel's minced meat, decreased from 3.5 × 10 3 CFU/g of the control sample to fewer than 10 CFU/g in the irradiated samples, with 2, 4 and 6 kGy of irradiation. Altogether, irradiating minced veal with doses higher than 2 kGy is able to considerably reduce the total colony count of coliforms. Moreover, the present work has shown that irradiation had a significant effect on reducing or removing S. aureus, in such a way that this pathogen was not found in irradiated minced veal samples which exposed to 7 and 10 kGy. This finding is similar to that of studied by Kanatt et al.(2005). They showed that the doses higher than 2 kGy of gamma irradiation are able to nearly remove the S. aureus from meat products. A similar research by Cava et al. (2005) also indicated that irradiation plays a critical role in controlling all the food-borne pathogens, including Escherichia coli, Listeria monocytogenes, Staphylococcus aureus and salmonellas. In 5 kGy radiation dose, the gamma irradiation led to reducing 5 Log 10 from the above-mentioned pathogens in meat products. In accordance with this results, Sommers and Boydd (2006)  and Bard (2005)  introduced the required dose of 1.8-3 kGy and 3 kGy of gamma, respectively, in order to considerably reduce the food-borne pathogens in ready-made food and processed pork. In addition, one remarkable finding in this study was that irradiating with high doses (more than 7 kGy) has a negative influence on some organoleptic features and meat quality, including color, flavor and fat oxidation rate. Thus, using irradiation with low doses (less than 5 kGy) is suggested for reducing the microbial load of minced meat. This result was in agreement with previously reported publications by Al-Bachir et al. and Kannat et al. Correct hygiene activities can considerably reduce the microbial load of veal and other veal products, during production and processing. Meanwhile, unfortunately, lack of modern slaughterhouses leads to slaughtering animals in traditional way, in many regions of Iran. This issue can play a critical role in increasing meat microbial load. Furthermore, the presence of pathogens, even in low amounts, can be dangerous for consumers. Decontaminating food items through irradiation is considered as a reliable, effective and healthy method together with the least possible amount of energy consumption, which deactivates microbial toxins as well as eradicating pathogen microorganisms. The authors would like to thank Dr. Khalafi, Ms. Sharifzadeh, Ms. Soltanpour and Mr. Sarlak, the members of Tabesh Gamma Center of Iran's Atomic Energy Organization, for their contributions in this study. 1. Al-Sheddy L, Al-Dagal M, Bazarra WA. Microbial and sensory quality of fresh camel meat treated with organic acid salts and/or biofidobacteria. Journal of Food Science 2004;64:336-9. 2. Coleby B. The effects of irradiation on the quality of meat and poultry. Int J Appl Radiat Isot 1959;6:115-21. 3. Mayer-Miebach E, Stahl MR, Eschrig U, Deniaud L, Ehlermann DA, Schuchmann HP. Inactivation of a non-pathogenic strain of E. coli by ionising radiation. Food Control 2005;16:701-5. 4. Unluturk S, Atilgan MR, Baysal AH, Tari C. Use of UV-C radiation as a non thermal process for liquid egg products (LEP). Journal of Food Engineering 2007;85:561-8. 5. Dogbevi MK, Vachon C, Lacroix M. Physicochemical and microbiological changes in irradiated fresh pork loins. Meat Sci 1999;51:349-54. 6. Davis KJ, Sebranek JG, Huff-Lonergan E, Ahn DU, Lonergan SM. The effects of irradiation on quality of injected fresh pork loins. 2004:67:395-401. 7. Borsa J, Lacroix M, Ouattara B, Chiasson F. Radiosensitization: Enhancing the radiation inactivation of food borne bacteria. Radiation Physics and Chemistry 2004;71:137-41. 8. Unluturk S, Atilgan MR, Baysal AH, Tari C. Use of UV-C radiation as a non thermal process for liquid egg products (LEP). Journal of Food Engineerin 2007;85:561-68. 9. Aymerich T, Picouet PA, Monfort JM. Decontamination technologies for meat products. Meat Sci 2008;78:114-29. 10. Iranian national standard no. 5272. Microbiology of food items and domestic animal feed. The Total Numeration Method of Microorganisms in 30 centigrade's degree. 2000. 11. Iranian national standard no. 437. Separation, identification and total 4 numeration of forms. 1995. 12. Iranian national standard no. 1194. The method of identifying and numerating coagolas Staphylococcus aureus (+) used for food items. 1987. 13. Dogbevi MK, Vachon C, Lacroix M. The effect of gamma irradiation on physicochemical and microbiological quality of fresh pork loins. Radiation Physics and Chemistry 2000;57:261-3. 14. Sweetie RK, Ramesh E, Arun S. Effect of radiation processing on the quality of chilled meat products. Meat Science. 2005:69:269-75. 15. Al-Bachir M, Zeinou R. Effect of gamma irradiation on microbial load and quality characteristics of minced camel meat. Meat Sci 2009; [Epub ahead of print]. 16. Kiss IF, Beczner Z, Zachariev G, Kovacs S. Irradiation of meat products, chicken and use of irradiated spices for sausages. International Journal of Radiation Applications and Instrumentation1990;36:295-99. 17. Kanatt SR, Chander R, Sharma A. Effect of radiation processing on the quality of chilled meat products. Meat Sci 2005;69:269-75. 18. Carrasco A, Tárrega R, Ramírez MR, Mingoarranz FJ, Cava R. Colour and lipid oxidation changes in dry-cured loins from free-range reared and intensively reared pigs as affected by ionizing radiation dose level. Meat Sci 2005;69:609-15. 19. Sommers C, Boyd G. Variation in the radiation sensitivity of food-borne pathogens associated with complex ready-to-eat food products. Radiation Physics and Chemistry 2006;75:773-8. 20. Badr HM. Elimination of Escherichia coli O 157:H7 and Listeria monocytogenes from raw beef sausage by gamma-irradiation. Mol Nutr Food Res 2005;49:343-9. 21. Farkas J. Irradiation as a method for decontaminating food. A review. Int J Food Microbiol 1998;44:189-204.